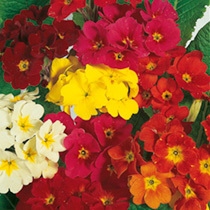 Selected over many years to bring a wide range of beautiful shades and large, long-stemmed flowers. For garden colour or cut flower posies for the house. Height 30cm (12"). HP - Hardy perennial. Delightful spring flowering colour for the garden. Once established, they will flower year after year. Sow March-July, planting out September-October to flower March-May the following year.